The following is from the Wikipedia entry (notes and some links omitted) on a must-see film: American Violet. The movie is based on a true story. While it’s been out for a couple of years, we just got ‘round to viewing it on Sunday. 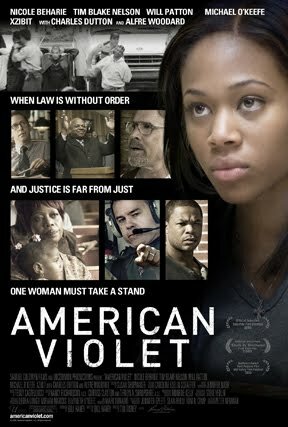 Set in the midst of the 2000 presidential election, American Violet tells the story of Dee Roberts (Nicole Beharie), a 24 year-old African-American single mother of four, living in a small Texas town (based after Hearne, Texas where the real incident took place). One day, while Dee is working a shift at the local diner, the powerful local district attorney (Michael O’Keefe) leads a drug bust, sweeping Dee’s housing project. Police drag Dee from work in handcuffs, dumping her in the women’s county prison. Indicted based on the uncorroborated word of a single and dubious police informant facing his own drug charges, Dee soon discovers she has been charged as a drug dealer. Even though Dee has no prior drug record and no drugs were found on her in the raid or any subsequent searches, she is offered a hellish choice: plead guilty and go home as a convicted felon or remain in prison and fight the charges thus, jeopardizing her custody and risking a long prison sentence. Despite the urgings of her mother (Alfre Woodard), and with her freedom and the custody of her children at stake, she chooses to fight the district attorney. Dee works with an ACLU attorney (Tim Blake Nelson) and a former local narcotics officer (Will Patton) to take on the Texas justice system. The film is based on the civil rights lawsuit Regina Kelly v. John Paschall, filed on behalf of 15 African-American residents of Hearne, Texas who were indicted in November 2000 on drug charges after being rounded up in a series of drug sweeps the ACLU referred to as “paramilitary.” The lawsuit accused Paschall and the South Central Texas Narcotics Task Force of conducting racially motivated drug sweeps for more than 15 years in Hearne. In 2005, the ACLU and Robertson County settled and the plaintiffs agreed to dismiss the individuals named in the suit, including Paschall. The fictional Harmon County represents Robertson County, Texas, where John Paschall continues to serve as District Attorney. Regina Kelly continued to live in Hearne, Texas until 2009. A “Hip-Hop Theory of [Criminal] Justice” is outlined in chapter 7 (123-145) of Butler’s book (see ‘Essential Reading’ below). For a critique from the perspective of what purports to be a more accurate account of such a “theory,” see the student Note, “This is Real Hip-Hop…,” from the Georgetown Law Journal, 99.4 (2011): 1179-1225. Abramsky, Sasha (2007) American Furies: Crime, Punishment, and Vengeance in the Age of Mass Imprisonment. Boston, MA: Beacon Press. Alexander, Michelle (2010) The New Jim Crow: Mass Incarceration in the Age of Colorblindness. New York: The New Press. Banner, Stuart (2002) The Death Penalty: An American History. Cambridge, MA: Harvard University Press. Butler, Paul (2009) Let’s Get Free: A Hip-Hop Theory of Justice. New York: The New Press. Cole, David (1999) No Equal Justice: Race and Class in the American Criminal Justice System. New York: The Free Press. Cusac, Anne-Marie (2009) Cruel and Unusual Punishment: The Culture of Punishment in America. New Haven, CT: Yale University Press. Davis, Angela J. (2007) Arbitrary Justice: The Power of the American Prosecutor. New York: Oxford University Press. Garland, David (2010) Peculiar Institution: America’s Death Penalty in an Age of Abolition. Cambridge, MA: Belknap Press of Harvard University Press. Irwin, John (2004) The Warehouse Prison: Disposal of the New Dangerous Class. Los Angeles, CA: Roxbury Publ. Mauer, Marc (2nd ed., 2006) Race to Incarcerate. New York: The Free Press. Mello, Michael A. (1997) Dead Wrong: A Death Row Lawyer Speaks Out Against Capital Punishment. Madison, WI: University of Wisconsin Press. Ogletree, Charles J., Jr. and Austin Sarat, eds. (2006) From Lynch Mobs to the Killing State: Race and the Death Penalty in America. New York: New York University Press. Patillo, Mary, David Weiman and Bruce Western, eds. (2004) Imprisoning America: The Social Effects of Mass Incarceration. New York: Russell Sage Foundation Publ. Perkinson, Robert (2010) Texas Tough: The Rise of America’s Prison Empire. New York: Metropolitan Books. Rhode, Deborah L. (2004) Access to Justice. New York: Oxford University Press. Rhodes, Lorna A. (2004) Total Confinement: Madness and Reason in the Maximum Security Prison. Berkeley, CA: University of California Press. Scheck, Barry, Peter Neufeld and Jim Dwyer (2000) Actual Innocence: Five Days to Execution and Other Dispatches from the Wrongly Convicted. New York: Doubleday. Tonry, Michael (1996) Malign Neglect: Race, Crime and Punishment in America. New York: Oxford University Press. Western, Bruce (2006) Punishment and Inequality in America. New York: Russell Sage Foundation Publ. Time again to waste incumbents with wasted votes?